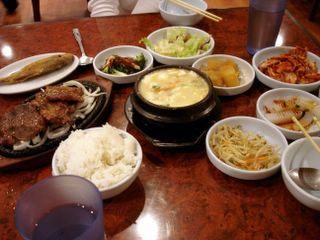 My personal favorite Korean Tofu Restaurant has to be Irvine Tofu House. It is hidden away behind the Weinerschitznel on Walnut and Jeffrey, in the same plaza as Taiko. The food is always dependable and the service has always been warm and accommodating. I usually order just a dinner combo (I think around $13.99) and an extra stone pot rice ($2.00). This is enough for my girlfriend and I (but we are light eaters). 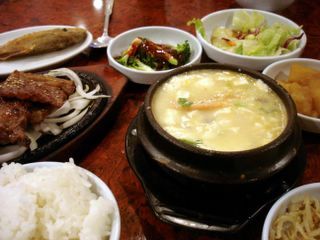 The one I usually order consists of one small tofu soup in a stone pot and a small dish of Korean BBQ Ribs. It comes out to a little over $20.00 with tip. You have your choice of different tofu soups, but we always opt for the combination soup, which has shrimp, clams, and small chunks of beef. Once you order, you are served about a half dozen banchan dishes. Some to eat on the spot, others to eat along with rice and your main dish. The banchan offered at Irvine Tofu House last Friday was; iceberg lettuce salad with a tart soy dressing (I ate this right away to prime my tastebuds); a white jello-like thing that is topped with scallions and chili; seaweed in a sweet chili paste; stir fried clear noodles with veggies; stewed potatoes; napa cabbage kimchi; and my favorite of all, a deep fried yellow croaker (a small salt-water fish). A raw egg is also brought to the table, for you to crack into the boiling tofu soup later. When the bubbling stone cauldron of tofu soup does come to your table, quickly drop the egg deep into the soup so that it may cook. I like to keep the yolk whole so that I can enjoy it later by itself with rice. Next the dish of BBQ ribs came, sizzling on top of sliced onions on a hot plate. The ribs were tender, sweet, and fatty -- perfect with a mouthful of rice, followed by a chaser of kimchi. Sipping a spoonful of the custardy soft tofu only heightens the experience. I love alternating between the different textures and flavors of the main dish and the panchan. Hot to cool, spicy to neutral, chewy to soft. At the end, the customary thing to do is try to scrape as much crispy rice that is left on the bottom of your stone pot with a spoon, and enjoy its crunch. It's like rice krispies. And depending on how much of the grease and hot sauce you managed to drip into your bowl, it will be a tasty rice krispie. Well, that's my take on Irvine Tofu House. It's again my personal favorite (close to home, warm and familiar), although I really haven't been to a tofu house I didn't like. I've been craving good Korean tofu since my mediocre experience a few weeks ago in Temple City. Thanks for the recommendation, I was doing a search in OC and couldn't find anything until my husband was able to refine a search that included your review. We went with your rec of sharing the kalbi and ordering and extra rice. He doesn't indulge on the little sides like I do, and I'm not a big meat eater as I am sides, so it was a good amount for both of us. I'd definitely come back here again if I choose not to make the drive out to Diamond Bar. Glad to hear you enjoyed it! I'm there just about every other weekend. Can't resist that "soon tofu" when the weather is this chilly. love to know your comment on BCD Tofu House newly opened in Irvine (Culver/Walnut plaza). i think it's a lot better than this one, but still far from the taste and better service in k-town's BCD. Oooh...BCD in Irvine! I'll have to check that out! Check out Hashigo Tofu in Costa Mesa located in the same shopping center as Anjin. They opened recently. I truly think they have the best Korean food in O.C. based on these comments I tried BCD and I have to say it has absolutely NOTHING on Jeun Tong tofu house in West Covina/ Walnut. I am a recent and zealous fan of tofu soup and while the BCD soup is good the side dishes made me sad (and stinky). Jeun tong is worth the drive for the side dishes alone.